South of Phuket and Phi Phi, towards the border with Malaysia lie some more excellent dive sites. Hin Daeng and Hin Muang (Red rock and Purple rock) are truly world class sites, offering steep walls, big fish and lush soft coral gardens. Whalesharks and manta rays are seen here quite regularly. 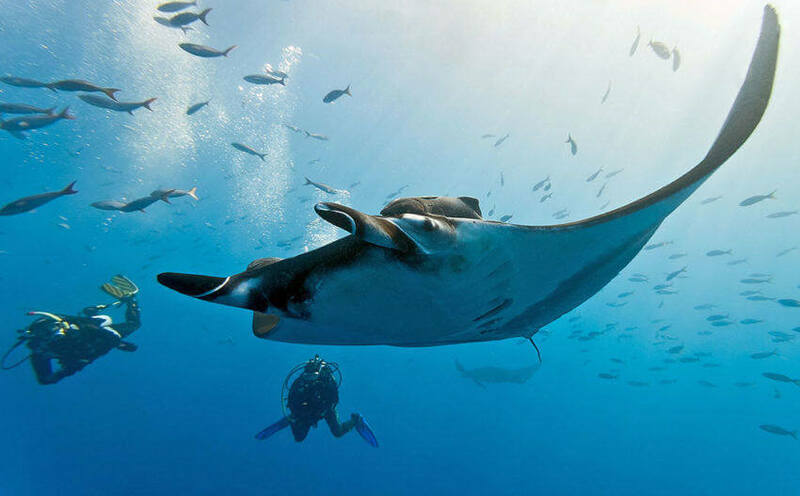 These sites are reached by liveaboards from Phuket such as Giamani on short weekend diving tours. Koh Ha is a great spot for a night dive and also offers a fantastic cavern dive known as “Twin Cathedrals”. 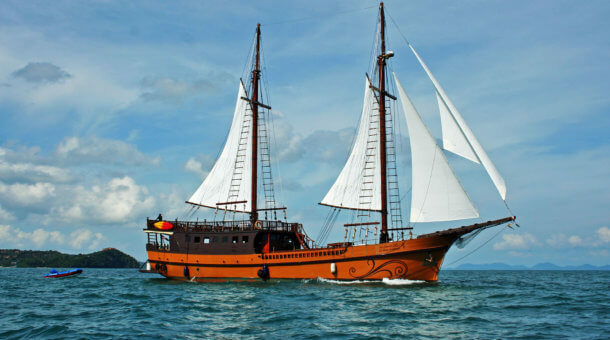 The South Islands liveaboard tours often also make a stop at Phi Phi Island. Some 40 nautical miles South of the Phi Phi Islands lies one of the best dive sites in Thailand. Just breaking the surface, Hin Daeng is a huge dive site with depths down to well below normal recreational limits. The South West side drops to over 60m, creating a steep wall of soft corals – leopard sharks are often seen in this area, and keep an eye out for whalesharks or manta rays. The East side has the best soft coral growth and two ridges that slope gently into deeper water. Pelagic fish such as jacks hang out close to the rock. In shallower areas moray eels are commonly found hiding in cracks in the rock face. Hin Daeng is also good for critters such as nudibranchs, cowrie shells and various species of shrimps. Hin Muang is a long rocky ridge just a few hundred metres from Hin Daeng with it’s top at a depth of 8-9m and it’s bottom at 60-70m. It is actually connected to Hin Daeng, but the depth prohibits a dive between the two. Currents can sweep quite strongly over the ridge, but you can always stay on the sheltered side. 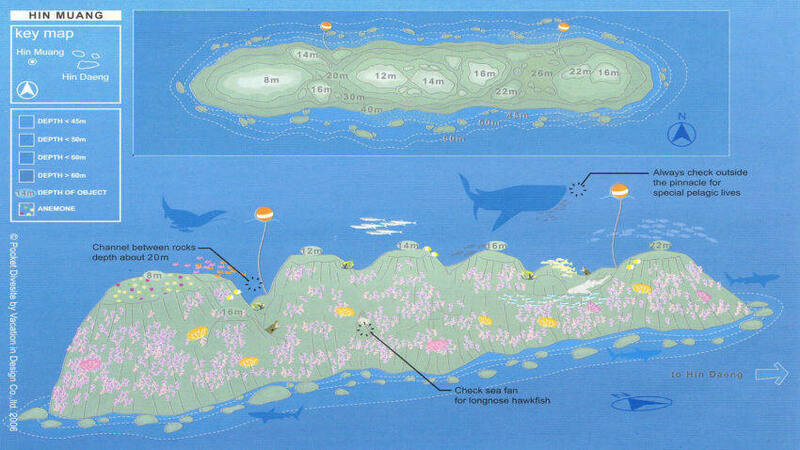 The surface of Hin Muang is covered in purple soft corals and anemones and swarms of tiny silversides are constantly under attack from predators such as jacks and trevallies. 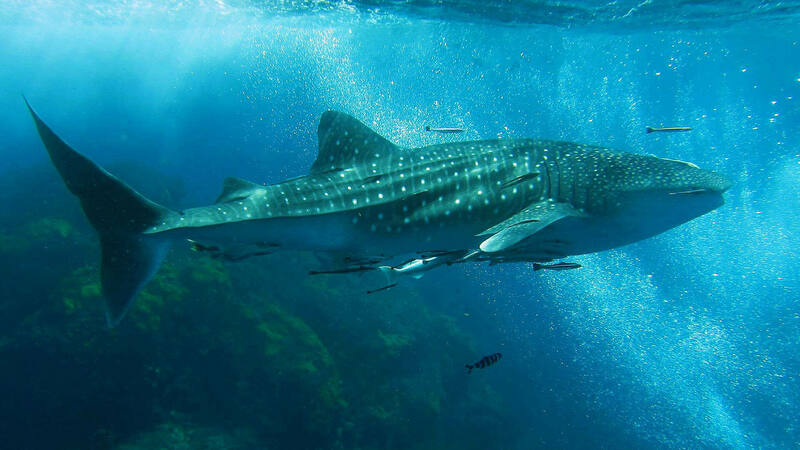 Leopard sharks are common and whale sharks are also seen here. Even if you don’t see a “big fish”, Hin Muang is a beautiful sight with it’s colourful corals and steep walls. Koh Ha lies between Phi Phi and Hin Daeng, close to Koh Lanta. 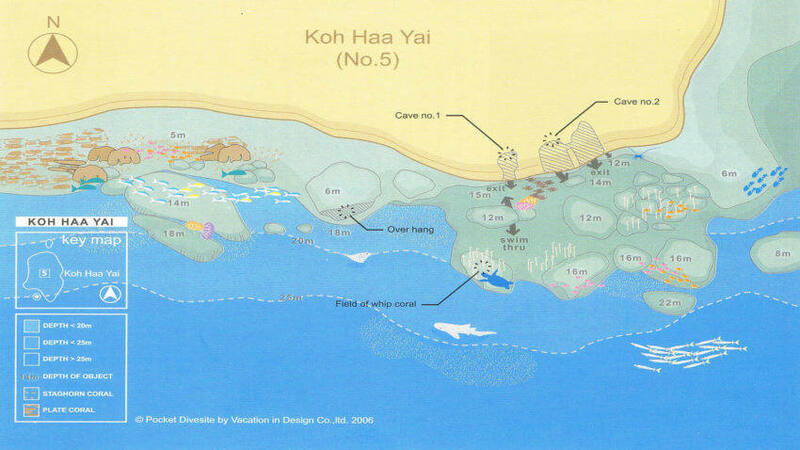 There are 5 small islands (Ha is Thai for five) with several dive possibilities. The best is on Koh Ha Yai where you find two enormous caverns with their entrance at 10-14m depth. A dive is best started on the reef to the West of the caverns, where there are some nice coral heads and fields of sea whips down to a depth of 20-25m. The caverns, though are the highlight. You can surface inside and see large stalactites hanging over your head. The light coming into the caverns makes for some beautiful photographs. At the back of the East cavern is a small hole leading to a tunnel some 25m long, ending in a chamber. This should only be attempted by divers with appropriate training and equipment. 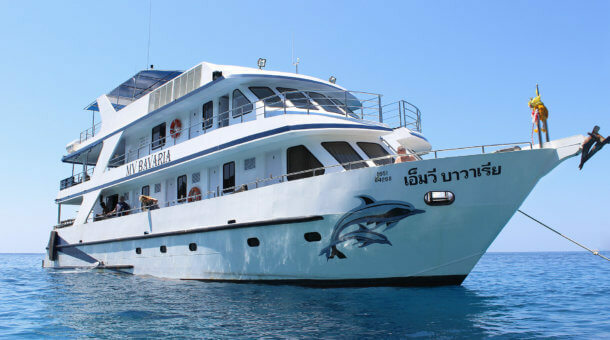 The southern liveaboard cruises also sometimes stop at Phi Phi. You may wish to step ashore and sample the local life or stay and relax on board. Diving at Phi Phi is also possible on day trips or speedboat charters from Phuket. 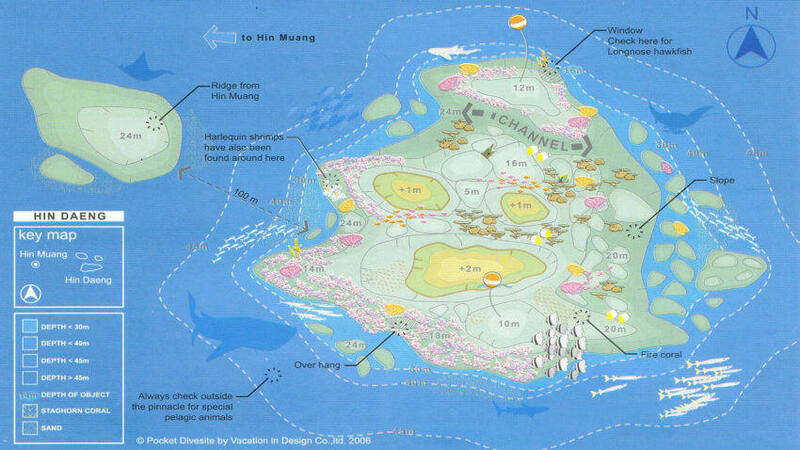 There are several good dive sites around these islands. 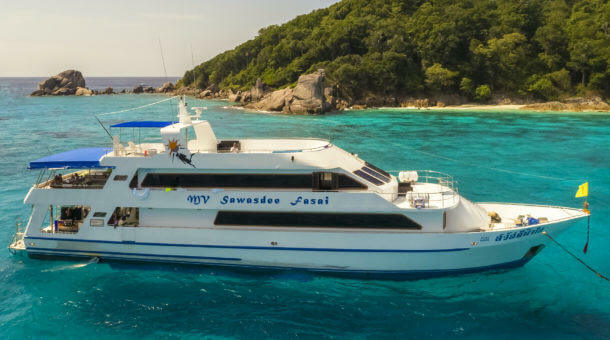 The Giamani liveaboard also often stops at Shark Point and maybe Koh Doc Mai whic lie between Phi Phi and Phuket – see the page on Phuket Dive Sites for details.